I’ve been organizing my fly boxes and re-ordering my line-ups (how I organize my “starters,” “back ups” and “in reserve” flies here). I’ve demoted a bunch of flies to “off the team.” There were probably a few dozen of them, experimental flies that just never worked. I’ve stripped them down to bare metal and will re-use the hooks. Still, it’s always good to experiment, and sometimes, I play around and find a pattern that just crushes it. Some flies produce year after year, and these include midge emergers in sizes 20 and 22. So, after last night’s amazing Patriots game, I slept in and decided to spend part of MLK Day organizing and re-loading the fly boxes. 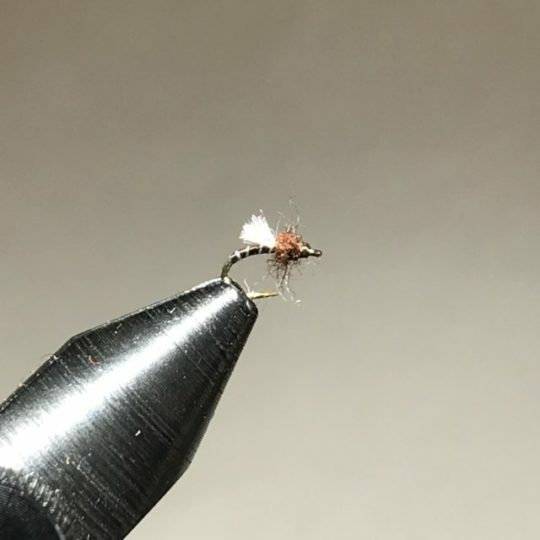 Some of my starters include Pat Dorsey’s Top Secret Midge and a pattern that Gary Metras mentioned in his Swift River Winter Fly Fishing presentation, the Red Brassie. For the latter, I’ve added a wing bud and will see how they fish. I know you’re supposed to fish midges in the winter, but, at the right kind of water, small midge emergers have worked year-round for me. 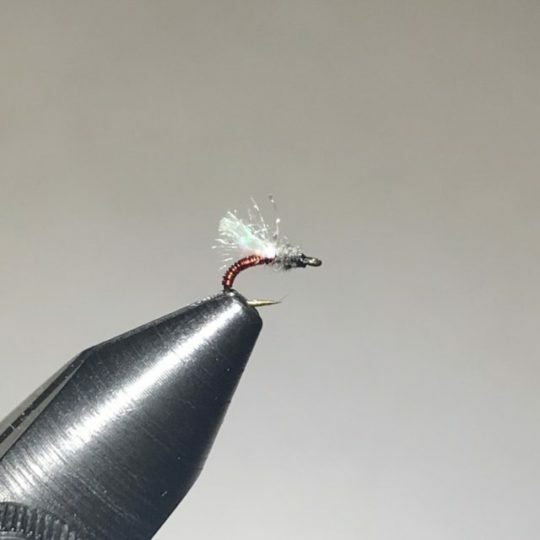 Making these tiny flies is actually pretty easy when I use thin thread, and I use black Veevus 12/0. There’s a chance I will be able to go to Atlanta for the Super Bowl. Fingers crossed! Ha, good day for doing it and thinking about Spring! Amen! I love to fish but 6 °F is a tad bit too cold! Struggled to get above zero here today. Great day for tying. Red brassie worked well for me with dry dropper all summer long. Thanks for the tip! Hope you’re well. Thanks for the plug! Red brassie #16 & 18 has worked fairly well on Swift lately. Caught nice ‘bow with it when I first got to the river, then when leaving saw the same fish in the same lie so I dropped the red brassie upstream so it would get down where it was holding and the guy took it again! Super Bowl bound?!! Excellent. Glad you’re fishing in spite of the flows and cold! On that “Red” brassie… Am I right that it’s not “red” wire, but instead is old school “brass” colored. Not that sort of golder “modern” brass color, but the darker color that would have been original equipment on Sawyers PT nymph for example? Hope you get to the game – should be a great one… Though I hope it stinks for everyone not in New England and the Pat’s finally win a super bowl by a big comfortable margin! Thank you! I use red wire. Have tried other colors but red is one of the better ones for me. I bought a piece of wood chuck at Kittery Trading Post last summer, mainly for tying Ausable Wulff dry flies. As the pattern calls for, the guard hairs make for a great dry fly tail, stacked or unstacked. I think unstacked actually looks better. That tan under fur on that skin is pretty nice too, very fine, and makes for good midge wings. I caught a couple of browns on that fly late fall fishing it on a dropper above a weighted nymph. Could you tell me how you fish these nymphs? For example, if you’re Euro nymphing, how do you rig unweighted midge nymphs? Great flies I may tie some up for my brother in law in Colorado.